This is the Bullionfield band of ca. 1954. At the time it was a Grade 3 band, and had considerable successes, winning many contests, including the World's Championship Grade 3. The following year, as I recall, they were promoted to Grade 2, and that was about the time I left to emigrate to the U.S.A. The only personnel I can identify are kneeling front, Drum Corporal Bert Thompson (left) and Norman McBean (right). Mill owner (the mill sponsored the band). To the left of him is Pipe Major Alec Herd, and next to him is his brother (name escapes me), also a piper. Also in the second row next to the bass drummer (whose name also escapes me) is Drum Sergeant George Black senior (previously with the City of Dundee Pipe Band). I can't identify any of the others by name. was called An Tostal over there. It had to be ca. 1954. 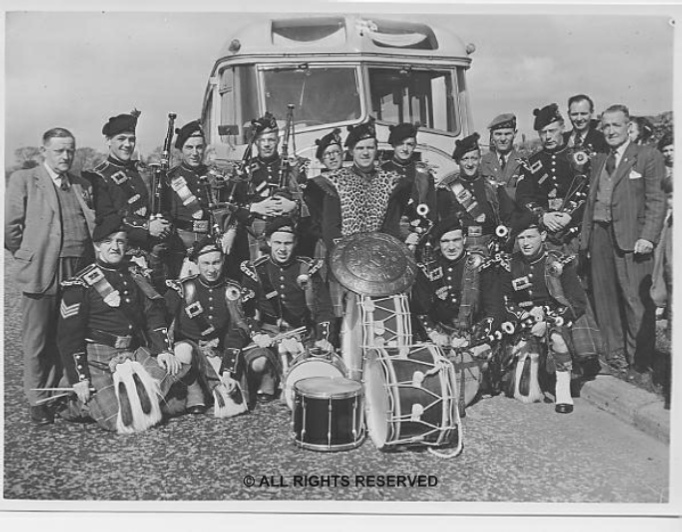 Front row kneeling from left - Drum Sergeant George Black senior, tenor drummer Norman McBean, Drum Corporal Bert Thompson, Andy Adamson, Pipe Major Alec Herd. Standing left to right: ? ? ? Albert Bowman, Ian Dallas, ? (Bass) Stewart Bowman, Alfie Smith ? Pipe Corporal Willie Wyllie ? ?. Information is coming in now and perhaps a summary so far will help with identities. Back row: ? ? Albert Bowman, ? Ian Dallas, ? ? Jim Shepherd, ? Middle row: ? 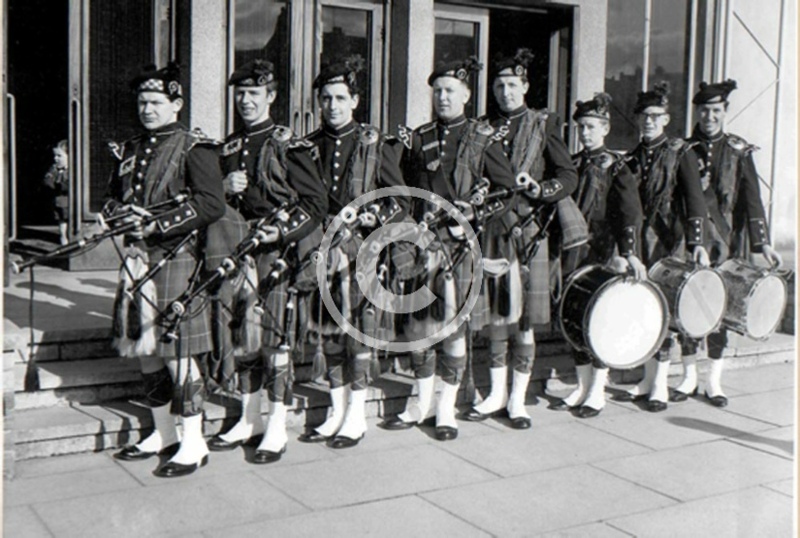 Brother of Pipe Major, Pipe Major Alex Herd, A. K. Wright(Mill Manager) ? George Black snr, ? A trio from the Bullionfield Pipe Band, ca. 1954. Left to right: piper Stewart Bowman, snare drummer Bert Thompson, tenor drummer Norman McBean. 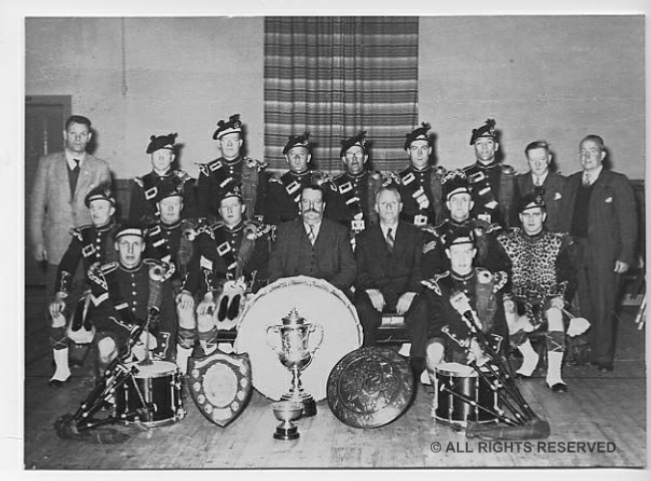 Ex-members of the 47th Dundee B.B. pipe band. 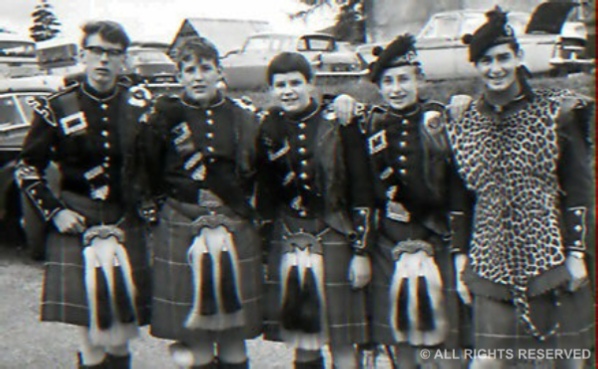 (From Left) Bob Mathews; Alex "Midnight Cowboy" Pattie; Angus Milton Paul; Kenny Melville; Jackie Lockhart; Roderick Chisholm, Ronald Hastie; Ronnie Paul. 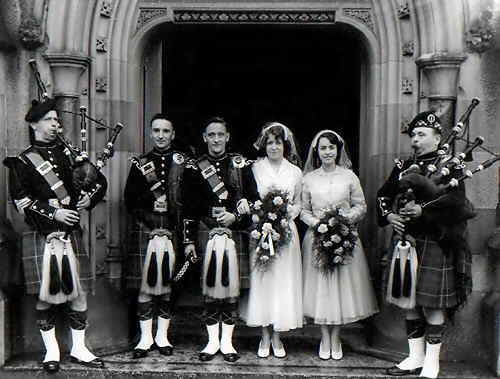 This Photograph was taken prior to 1963 when it was not uncommon for Band members to marry in uniform. 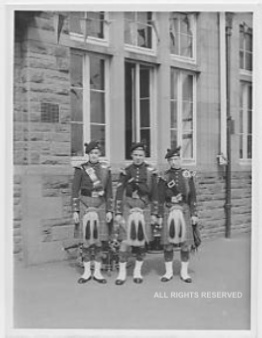 This photograph shows drummer Alfie Smith (Groom) being piped out of Lochee West Parish Church, Dundee, by the Bullionfield's Pipe Major on the left, and his brother,William Smith, on the right.